Chalk up another eyebrow-raising construction engineering marvel in Asia. Malaysia and Taiwan may have the world’s largest skyscrapers, but China is becoming the “quick construction” center of the universe. The latest example is a 30-story hotel prototype structure built in Changsha, China in just 15 days at the end of last year. Broad Group, the construction company responsible for the feat, claims that the 183,000 sq. ft. hotel can withstand a 9.0 magnitude earthquake, along with being substantially more energy efficient, sound and heat insulated than conventionally constructed facilities. Broad Group completed this hotel just a few weeks after completing another “quick construct” project in China’s Hunan Province — the 15-story Ark Hotel — in just six days. 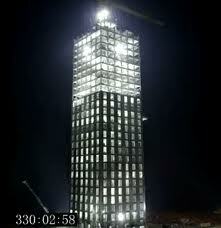 Here’s a time-elapsed video of the Ark Hotel construction, spanning a grand total of 360 hours. Reportedly, there were no on-the-job injuries despite the hyper-compressed timeframe. How did Broad Group accomplish this feat? The company reports that it uses prefabricated modules rather than building the entire structure onsite. These modules shorten the time while making construction management coordination much easier. It’s interesting to see in the video how that coordination works to telescope the time needed for building. Of course, the next question that comes to mind is whether something like this could ever be “exported” to the United States. Or would there be a raft of regulations, safety and environmental obstacles in the way to make it impossible? Anyone care to weigh in with thoughts? Well, it wasn’t really constructed in 15 days—it was ASSEMBLED in 15 days. One suspects the component modules took additional time to manufacture. We have modular homes here that also are quick to build. Just lay a foundation, plug the pieces together, hook up the electricity and plumbing (and cable), and voilà! What is interesting is that the codes inspectors (we assume there were codes inspectors) were apparently johnny-on-the-spot so that construction could move briskly forward without interruption. …And what a brilliant PR ploy! The construction company obviously believes modular construction is the way to go. So they devise an angle—”from groundbreaking to completion in a fortnight”—to call attention to their technique. Whether it’s preferable to construct most of a building in a factory rather than on-site is a question I can’t answer. But it sure makes for quick work once the footings are in place. That, in turn, makes for a great YouTube video and gets people all of the world talking about it. When I look at many of the wonders in this nation like our hydro-electric dams, I’m certain that many of them would now take decades to build in the this country, if they could be built at all. The environmental impact study alone would likely take a half decade to complete. The typically fear-driven (patriarchal) response to this is to feel threatened – while, of course, loudly denying it. One is the cabin in the woods, made with an axe and a saw according to an unfolding vision – aka what suitable trees you have within reach. The design changes along the way and it sort-of happily remains a work in progress. The other, as in this ‘feat,’ is one of vision and design and the cooperation of a tightly managed large number of people. And Wes is right, it is an assembly job, with the design and manufacture done offsite. Strictly speaking, you would also have to consider the engineering and construction of the crane as an additional undertaking. Compare that to the hatchet and a saw and any number of trees and maybe 1-2 pairs of hands . . reeeeeally not that much of a difference. The tree is you pre-fab construction module, manufactured by Nature offsite, so to speak. The couple of blokes doing the work also have a vision . .
And just to further confuse the picture with another extreme: How about 10+ story mud buildings in a seismically very active region of the world that have stood for centuries …? In a way, it’s all ‘BFD’ when compared to life.